On a trip outside the Light of the Trees (maybe outside the Pelori near Alqualonde?) 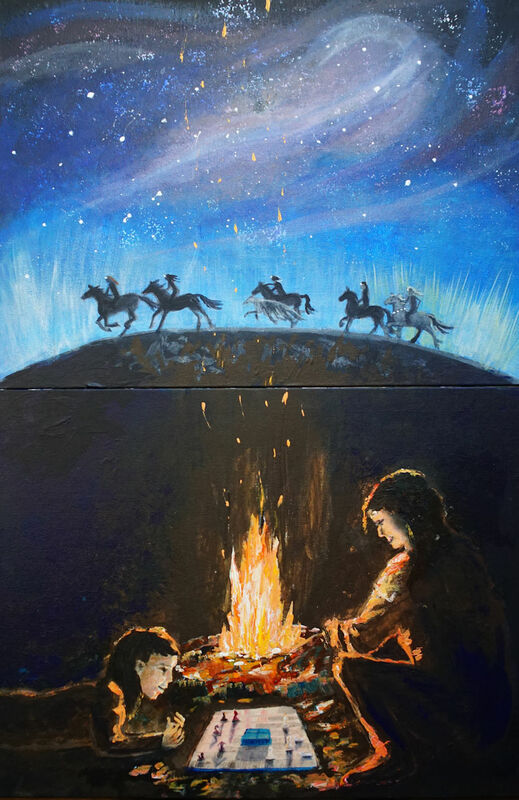 Maglor and little Caranthir are playing a game by the fire, while Maedhros, Fingon, Celegorm, Huan, Turgon and Finrod are out riding on the hill. 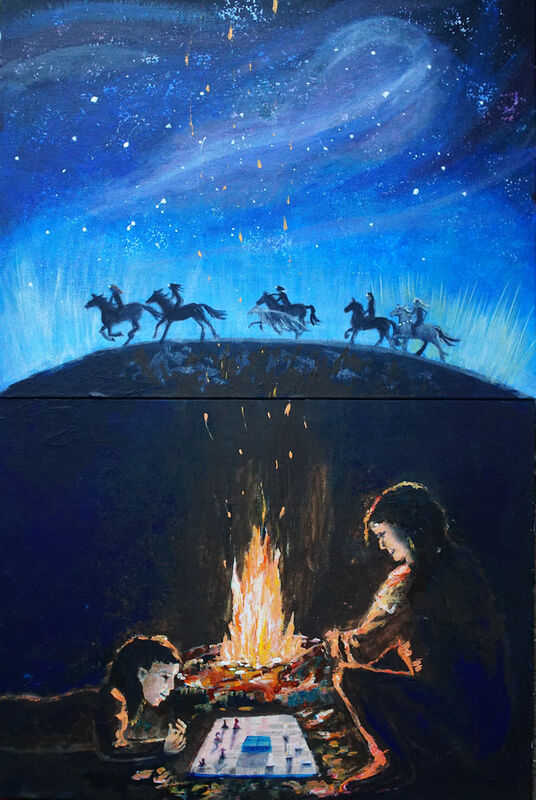 I painted this as two paintings, not sure if both of them would actually work, but I'm quite pleased with them: I think they do work together as a whole. I tried photographing this in natural light (above) and with daylight bulbs (below). The natural light was evening light and it has left the firelight looking a little colder than the warmer firelight seen in the light of the daylight bulbs, but the artificial lighting was less kind to the starry sky, so I ultimately decided to go with the natural light. I really, really love these. I'd have a hard time choosing between the two different versions of lighting. Love the silhouette of the horses and riders on the hill. Thanks... what a great match for your icon the riders are! The pair work very well together I think. I love the coziness below contrasted with the almost magical-looking goings on above. I'm curious. What size are the originals? Did you model the game on a real one? The originals are 40cm x 30cm, so not huge, but bigger than the A4 paintings I'd been doing previously. It does help to have a bit of extra space to work on, but I'm trying not to go too large because nightmare storage problems! The game was going to be chess, but I realised in time that I don't know anything about chess and if I just put pieces in random places on the board, people who DID know about chess would automatically obsess about the game and ignore the paintings. Fortunately, I had previously invented a game called King's Table, which people play a lot in my fanfic, so that's what they are playing. Pp thinks I need to make a board and work out rules. I told him I would delegate that to him :-D.
Love them. You have a real gift.